Hey Love: Finds Under $40!! Stripes!! The green dress is stunning. Ooh I love all of your picks! The two-tone baseball tee is probably my favorite! I love the green striped dress and those flats! Wonderful finds! I love the clutch !! Those oxfords are fabulous! Really awesome finds! 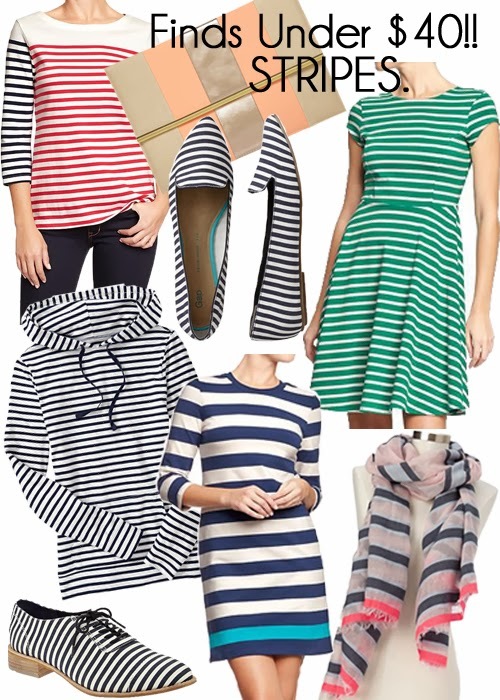 I'm obsessed with stripes too!! Love your picks! Gorgeous picks! I love a bargain! I love stripes! Literally every other shirt in my closet is stripped :-) love this post and your finds! I do love a good stripe! Great round-up! Those Gap oxfords are so cute! I would be scared to wear them, for fear of getting them dirty. so cute!! im obsessed with stripes. love all of these pieces! Stripes are awesome. Navy strives even better! Lovin' those Gap Flats! ooh great choices! i am loving big bold stripes right now...and u picked some really amazing pieces! Wow! Great picks! I need those loafers urgently! Gorgeous picks! Stripes are always a winner! I love that hoodie, I cannot pull off stripes though.